An international team of scientists has announced a second instance of the detection of gravitational waves—ripples in the fabric of space-time. The observation was made on Boxing Day, 26 December 2015 – following the first ever detection of its kind in September 2015, which was at the centre of much publicity earlier this year. Gravitational waves carry unique information about the origins of our Universe and studying them is expected to provide important insights into the evolution of stars, supernovae, gamma-ray bursts and neutron stars, as well as black holes. Both discoveries were made by a global team of scientists as part of the Advanced LIGO (aLIGO) project – involving many researchers from the UK, including mathematicians from the University of Southampton. This latest observation is of two black holes, 14 and eight times the mass of the sun, orbiting each other over 25 times, before merging into a more massive spinning single black hole, 21 times the mass of the sun. The gravitational waves were detected by both of the twin Laser Interferometer Gravitational-wave Observatory (LIGO) detectors, located in Livingston, Louisiana, and Hanford, Washington, USA. This second event indicates that there is a rich population of binary black holes in the Universe, whose properties are gradually starting to emerge. Gravitational-wave astronomy is no longer a field of single detections, but of regular observations. The latest discovery transforms the LIGO detector into a true astronomical observatory. Mathematician at the University of Southampton, Dr Ian Jones works on aLIGO with his PhD student Greg Ashton. Dr Jones has spent 13 years on the international gravitational wave detection project, providing colleagues with models for what the gravitational wave signals from small dense stars, known as neutron stars, might look like, and advising how best to search for these signals. The discovery, accepted for publication in the journal Physical Review Letters, was made by the LIGO Scientific Collaboration (which includes the GEO Collaboration and the Australian Consortium for Interferometric Gravitational Astronomy) and the Virgo Collaboration using data from the two LIGO detectors. Scientists believe that in the future we’ll see many of these binary black hole (BBH) systems, with aLIGO. With future detectors of increasing sensitivity, we will start to do cosmology with Gravitational Wave signals – aiming to use a totally new way to probe the mysteries of the expansion of our Universe. The LIGO Scientific Collaboration comprises over 1000 scientists from 17 countries, and includes researchers from ten UK universities (Glasgow, Birmingham, Cardiff, Strathclyde, West of Scotland, Sheffield, Edinburgh, Cambridge, Kings College London and Southampton). 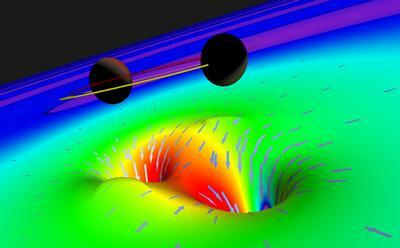 For more information about the discovery of gravitational waves read our press release.